Who’s ready for a summer road trip? You are! You’ve got your sunscreen and beach towel in your cute straw bag. Roadtrip playlist on the iPod. Beverages in all 15 of the cupholders in your SUV. Maps? Snacks? Pool noodles? Wet wipes? Backup snacks? Check, check, and check. But the most important thing you can bring on your vacation is a properly installed car seat for your kiddo. As a parent, it’s normal to feel some pressure to get everything right for your child. You look for the toys that boost creativity. You buy the organic baby food. You make sure the playroom paint is toxin free, baby-proof the toilet, and try to make sure that time spent on the electronic device is at least a little bit educational. Truth is, no one is perfect and we all do our best, and usually that’s good enough. (The fact that we survived our seatbelt-free, smoke-filled 1970s childhoods is proof of that, right?) We go to great lengths we go to keep our children safe from sunburns and pesticides, but statistically speaking, the biggest threat to a child’s health is not from food or the environment—it’s a car accident. And although a car seat is the best way to protect a child from injury, a staggering 75% of car seats are not properly installed. Installing a car seat is not an easy task. Getting a seat securely fastened into a car, and then getting the child secured in that seat, can reduce any parent to a heap of frustration and jammed fingers. That’s where Buckle Up For Life, the national child passenger safety program from Cincinnati Children’s Hospital and Toyota, are working to make a difference. They have released this list of must-know tips keeping your littlest road-trippers safe for summer travel. Don’t worry, this has nothing to do with swimsuit readiness! Pinch the car seat strap near the child’s shoulder; if you can pinch a wrinkle in the fabric, tighten the strap until it is snug. For the “Inch Test,” grab the car seat from the back and bottom and tug from side to side and front to back. If the seat moves more than an inch in either direction, tighten it. Car seats can get hot in summer weather, and sticky treats like ice cream can cause spills – but don’t be tempted to pile up towels in your child’s seat to keep them cool or tidy. Extra material could interfere with the seat’s ability to restrain the child in the event of a crash, so it is important to only use accessories and products specifically approved for use by the seat’s manufacturer. If the car seat is hot because of high summer temperatures, take some extra time to cool the car down before placing your child in the seat. Open the windows, turn on the air conditioner, and test to ensure plastic or metal buckles are not hot. Once the seat’s temperature has reached a comfortable level, always buckle your child in as usual – even for short trips. Never leave children alone in the car, especially in the summer, when temperatures can escalate dangerously in a matter of minutes. 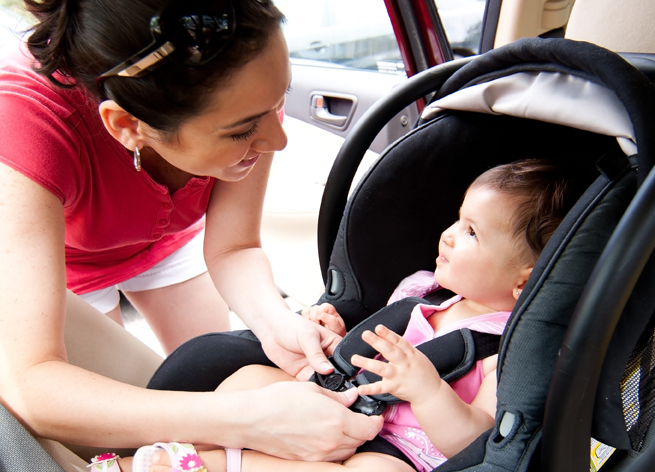 If you are renting a car this summer, use your own car seat. When you rent a seat you don’t know important facts about its history that could affect its ability to protect your child (e.g., expiration date, crash history, etc.) The good news is that most airlines allow you to check your car seat for free. Make sure all loose items – particularly summer travel essentials such as beach chairs, coolers, umbrellas and suitcases – are tightly secured in your vehicle. These objects could become projectiles in the event of a crash. So, now that the car seat is properly installed, everyone has gone to the bathroom one last time, and our icy drinks are securely in our cupholders, it’s time to get moving and have some fun! Happy summer, everyone!